My five kiddos really love to celebrate Easter, it signals the beginning of spring and all sorts of outdoor play time activities, not to mention all the fabulous Easter treats and desserts that come along with the holiday. I like to fill their Easter baskets with homemade treats and they really enjoy pitching in to make fun Easter themed desserts. 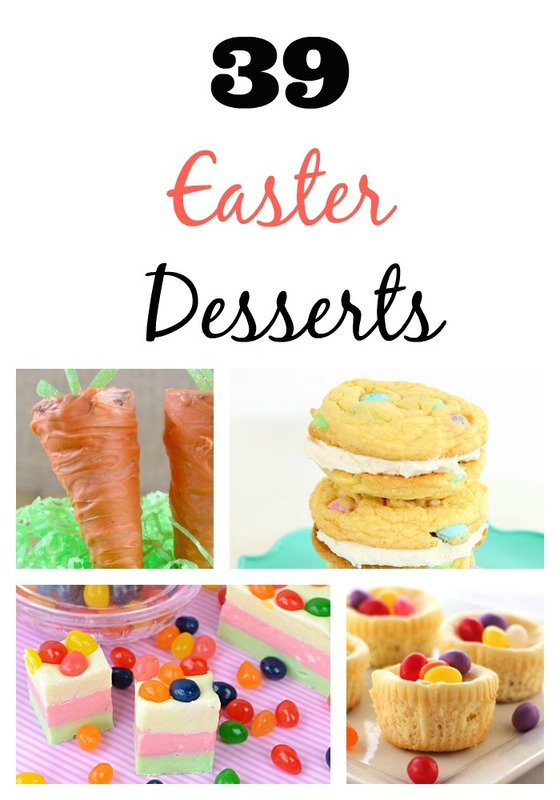 Here’s a terrific list of 39 delicious Easter dessert recipes that your family is sure to love. The blueberries have been plentiful this year and they started coming in early so we even have a bunch in the freezer. Blueberries keep very well in the freezer and we like to pop’m out and eat them by the handful just as they are, but there are also so many yummy blueberry recipes available that I put together this roundup of a variety of different things to make with them. This Simple Blueberry Cobbler recipe is my own guest post at $5 Dinners and it’s my go to dessert during blueberry season. It’s delicious and very easy to make! These Blueberry Hand Pies from Camille Styles look absolutely scrumptious and are great for creating individual servings or for eating on the go. Coffee cake is one of my all time favorite desserts and I can’t wait to try out this Blueberry Coffee Cake version from Joy of Baking. You can buy gourmet flavored marshmallows online for about $1 a piece so I searched and found this fabulous Blueberry Marshmallow recipe from YumSugar. For the summer months especially I think this Blueberry Sorbet from Easy Paleo is a wonderful and tasty treat! I know the kids are going to love this stuff! Beloved Green’s Blueberry Power Smoothie is a fabulous way to start any day! What a perfect way to get up and go. I could eat pancakes for breakfast, lunch or supper and these Blueberry Ricotta Pancakes look absolutely delicious! I searched and found a recipe from Giada de Laurentiis at Food Network that I simply must try. 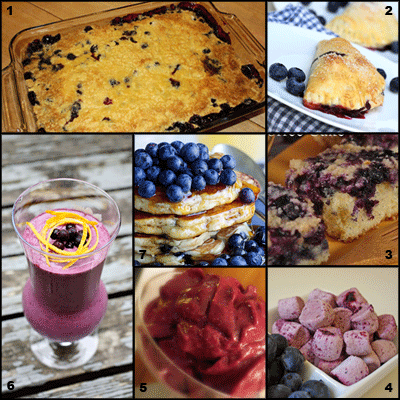 Check out my Better With Blueberries board on Pinterest and let us know about your favorite ways to eat blueberries! 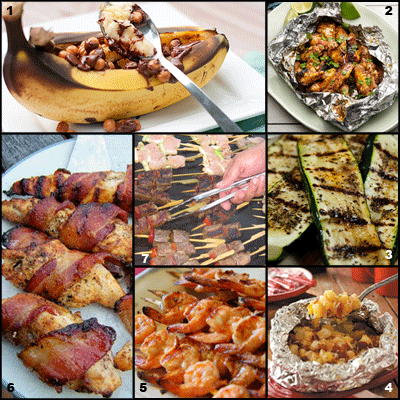 Tasty Tuesday: Get Out The Grill! One of my favorite things about summertime is whipping out the grill and doing some outdoor cooking! The kids love to help, everybody gathers around and it somehow becomes an event. This week I’m trying to get away from the same old burgers, sausages and hot dogs to bring you some different recipe ideas for your next cookout! These stuffed bananas from Karly of Buns In My Oven are the perfect way to make dessert while you already have the grill out for supper! Use any toppings you’d like, throw them on the grill while you eat your meal and they’ll be ready just in time using the remaining heat from the grill. Cooking smaller or more fragile pieces of meat is super easy when you use a foil packet, like with these Jerk Chicken Wings from the Food Network. Grilling vegetables really helps to bring out their flavor and the grill marks add so much flare to the presentation! These grilled zucchini slices from Another Pint Please were brushed with olive oil and sprinkled with oregano before grilling and you could do the same with asparagus or grill up fave veggies like potatoes and corn on the cob. Why stick to boring old baked potatoes when you can grill up these Three Cheese Potatoes from Taste of Home? Using the foil packet technique again you can easily make these delicious potatoes on the grill while the rest of your meal is cooking. These marinated grilled shrimp from MomAdvice use only a few simple ingredients but are super tasty! You could serve these either warm or chilled, but something about cooking them on the grill makes them taste so good. The combination of chili pepper and brown sugar in this Sweet & Spicy Bacon Chicken recipe from Diary Of A Recipe Addict make for a yummy twist on the classic barbecue chicken. And isn’t everything just better with bacon? Grilled foods on a stick, like these Beef Skewers with Yakitori marinade from Chef Curtis Stone make summer entertaining easy. Finger foods are great for mingling and cleanup is a breeze! 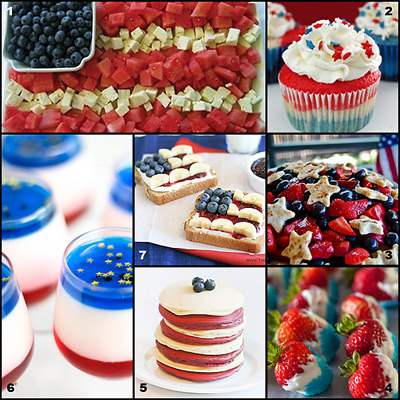 Here are some fun red, white and blue food ideas just in time for our 4th of July celebrations next week! 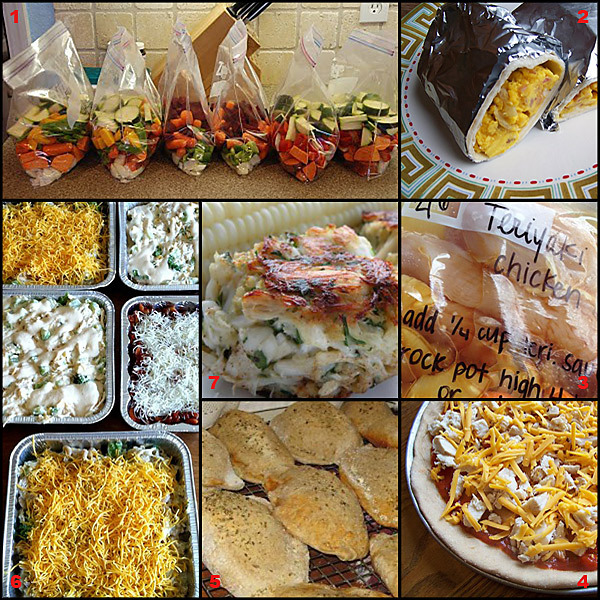 If you’re headed out to a picnic, BBQ or potluck just whip up one of these delicious concoctions to take with you. Seasonal fruits and finger foods like blueberries, watermelon chunks, strawberries, bananas and a selection of cheeses can be displayed in the shape of a flag like this cute watermelon and cheese tray I found at Blush Printables. Fresh fruit trays are super easy to throw together and are always crowd pleasers. I love these red, white and blue cupcakes from Grin and Bake It where they used food coloring and white cake batter to make tri-color treats. This would be fun to do in other colors at different times of the year, like maybe pink and purple for my daughters’ birthday. This Berry Cheesecake Pie from Natalie’s Killer Cuisine combines three of my favorite things – pie, cheesecake and fresh fruit! I can’t wait to try out this recipe and I’m sure it will be a big hit with the kids. How cute are those pie crust stars? Strawberries dipped in white chocolate and then blue sprinkles like these from Katie Mahoney Photography are a creative take on the fruit plate theme and they just made it onto my ‘to do’ list. What a great idea for a home cooked breakfast on the 4th – these patriotic pancakes from I Am Mommy are perfect for both kids and adults. You could also consider adding the blueberries to the batter. Fruity parfaits are easy to put together in a patriotic theme, and these Panna Cotta Shooters from Sprinkle Bakes are a great way to mix a dessert and a cocktail. The confetti stars are a nice touch and they’re almost too pretty to eat. Patriotic peanut butter and jelly sandwiches made like this cream cheese and jam version that Deborah at Taste and Tell blog found, are a very creative way of serving lunch to a crowd or you could do this on toast in the morning for breakfast. I absolutely love the idea of being able to make cake pop gift bouquets for all sorts of occasions like birthdays, teacher appreciation gifts, and for holidays like Christmas and Valentine’s Day. Using scrapbook paper inside a clear acrylic cup is a great way to create a matching display for these gorgeous brown and blue themed bouquets from Make A Whisk. These adorable bride and groom cake pops are terrific for wedding or shower favors, centerpieces, and for noting seat assignments. There are lots of wonderful designs for weddings, like these glitter monogram pops from Cake Pop Star, and they can easily be done in the wedding colors. 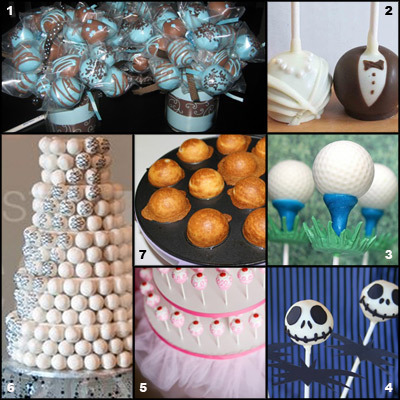 The possibilities for creating decorative cake pops for any theme are simply endless! The beer cake and bacon frosting golf ball cake pops shown above were created by 1 Fine Cookie for a Father’s Day party, but you could make honeybee cake pops for a spring party, watermelon cake pops for a summer party, or these gorgeous baby girl cake pops for a baby shower. Cake pops are wonderful treats or gifts for any holiday like these spooky skull cake pops from The Sugar Turntable for Halloween. Red, white and blue cake pops arranged as a flag make a great display for a 4th of July barbecue, and chocolate dipped cake pops with pretzel antlers and red hot noses make yummy Rudolph cake pops for Christmas. There are so many neat display ideas to choose from like this gorgeous ribbon and tulle covered cardboard “cake stand”. You can create your own styrofoam displays or buy ready to go cardboard, wood or lucite cake pop stands . Creating tiered “cakes” from cake pops is a whimsical yet elegant way to display lots of cake pops for large numbers of guests. This wedding cake made from cake pops is a neat example and is also perfect for providing different flavors, simply make each tier a flavor and display a flavor key on a card nearby. You can use most any kind of mix in your cake pop maker to make quick and delicious snacks like banana nut bread pops, blueberry muffin pops, and pancake pops! My friend Lynsey even uses hers to make refrigerated cinnamon rolls from a tube and to make her own delicious version of corn dog pops. 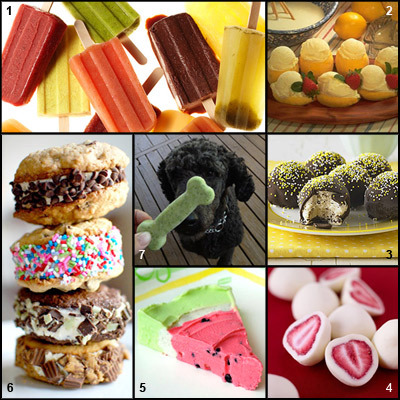 Check out my Crazy for Cake Pops Pinterest board for many more great cake pop ideas!